Tropheus moorii “Murago” and its equal from Tanzania. The new Tropheus moorii “Murago Tanzania” was discovered along the Tanzanian shore of Lake Tanganyika in 2008 (Karlsson and Karlsson 2012) and was localised in 2013 by Konings, Andersson and others (Andersson 2013). It was first presented in the Journal of the Nordic Cichlid Association NCS, Ciklidbladet 2/2012 (Karlsson and Karlsson 2012), later in the book Tropheus in their natural habitat (Konings 2013) and most recently in a post on the Cichlidroom Companion (Artigas Azas 2013). Fig. 1. 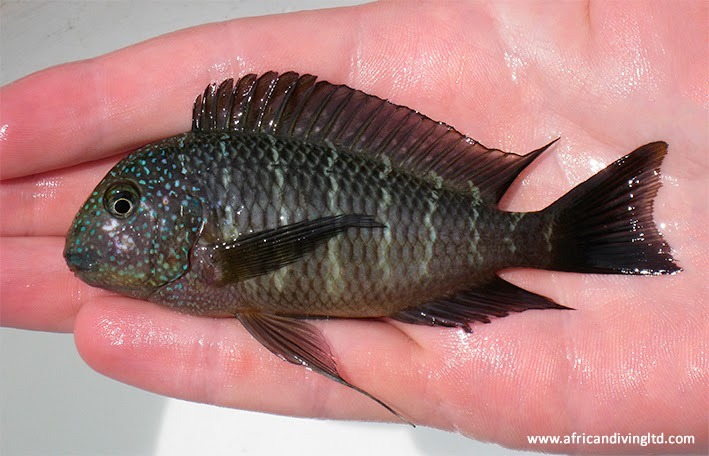 Newly collected young male of Tropheus moorii "Murago Tanzania"
We first discovered the fish on May 11, 2008 when it was photographed and captured on video. On October 1 the same year we returned to the location to complete our material. The population was sampled by a number of adult specimens that were preserved and deposited at the National Museum of Natural History in Sweden. DNA samples were deposited along with the collection. For study purposes, a small number of juveniles were produced and presented on a picture in the mentioned journal. The remaining adult specimens from the breeding group were preserved as well. 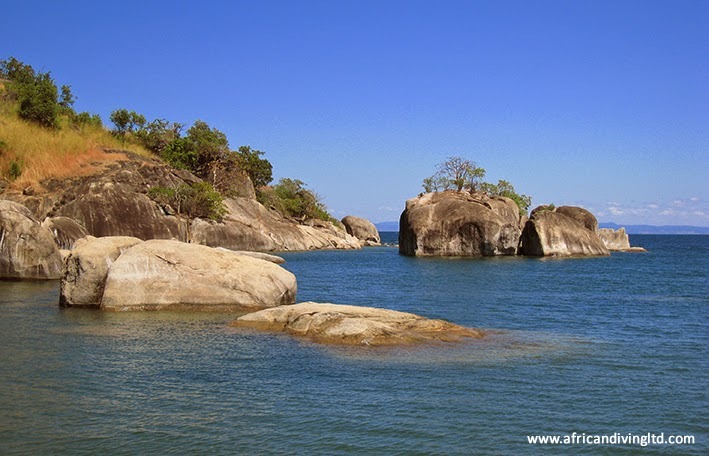 The population of Tropheus moorii “Murago Tanzania” is confined to a 2 km long shoreline with accompanying dispersed rocks and stone build-ups. The habitat is further limited by recurrent sandy areas interspersed in the rocky biotope and by a restricted area of stones giving way to the sand bottom at rather shallow water. Due to the population’s limited habitat and hence its vulnerability to collection for the aquarium hobby, we have decided not to disclose the location. It is our hope that it will remain undisclosed even though the location now is known by others. Fig. 2. Locality of Tropheus moorii "Murago Tanzania"
In the same article in the Journal of the Nordic Cichlid Association (Karlsson and Karlsson 2012), some background information onTropheus moorii “Murago” from Congo was given and the long-secret location of this population was revealed. A detailed map over the area was presented. The information of the location was obtained from our friends Francis Maccio and Christian Simon (Marseille, France) in 1996. The secret was well kept for 15 years. Nowadays the knowledge is widely spread among local fishermen in the tropical fish trade, and we considered the time being right to share the information as an accurate reference for the benefit of hobbyist and scientist alike. In terms of vulnerability the Tropheus moorii “Murago” in Congo enjoys, in contrast to its Tanzanian counterpart, some extent of natural protection from over-fishing (by the tropical fish trade), as the location is exposed to inclement weather. Heavy winds and the succeeding increased turbidity in the water limit the catch considerably. Although the habitat in Congo is small, it’s still twice as large as the habitat for the newly discovered Tropheus moorii “Murago Tanzania”. Fig. 3. 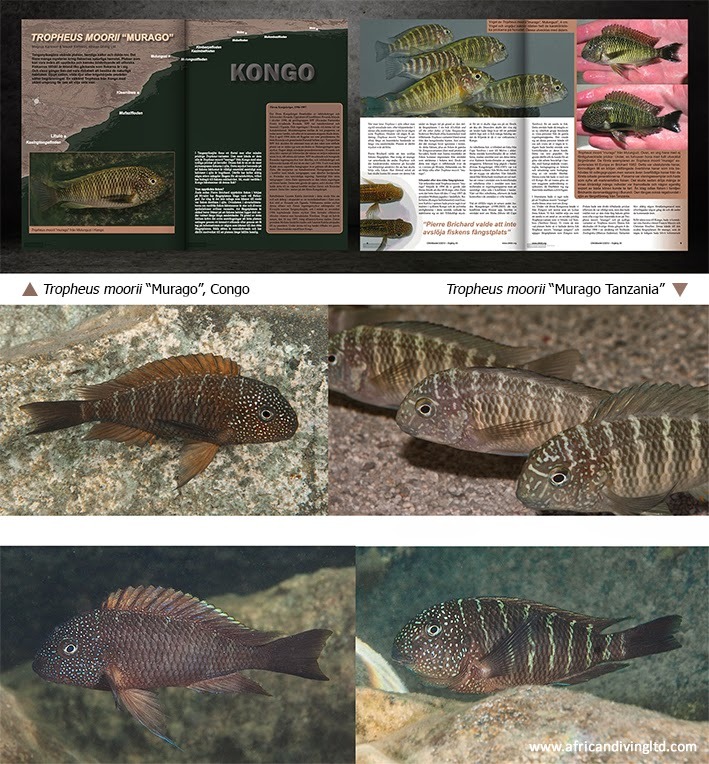 Spreads from the NCS journal (Karlsson and Karlsson 2012) and pictures of Tropheus moorii “Murago Tanzania” showing an adult male in the wild (center left), juveniles of size 5 cm in the aquarium (center right), a dominant male in the wild (bottom left) and a brooding female in the wild (bottom right). Andersson, L. (2013) Tanganyika 2013 del 2. Nordiska Ciklidsällskapet. http://www.ciklid.org/forum/showthread.php?68770-Tanganyika-2013-del-2 Retrieved November 12, 2013. Artigas Azaz, J. M. (2013) The Murago form of Tropheus moorii has been rediscovered by Ad Konings. The Cichlidroom Companion.http://www.cichlidae.com/news.php Retrieved January 7, 2014.